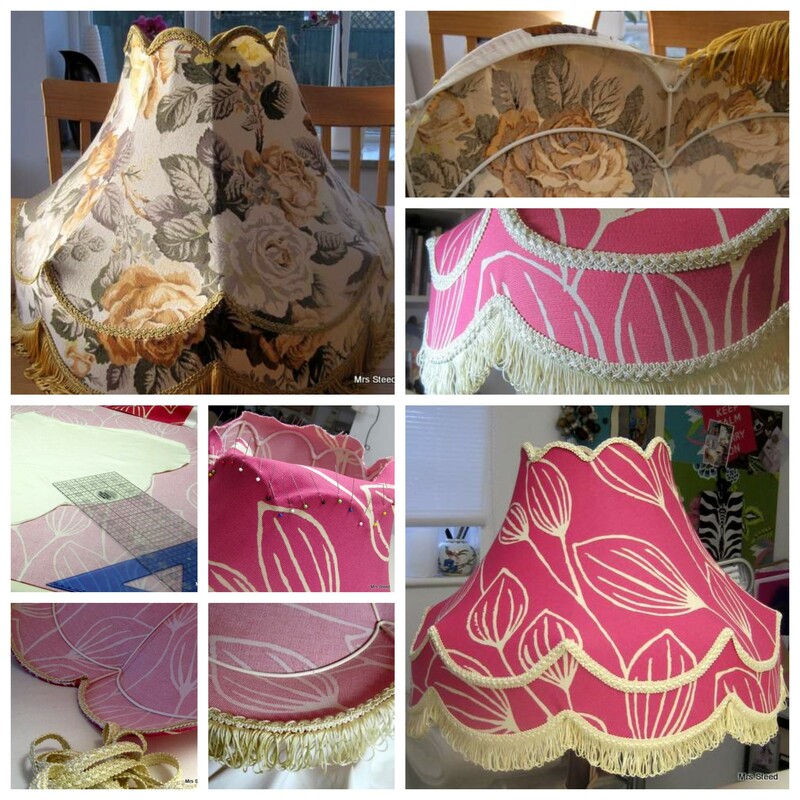 This lovely project was brought to me by my client who had bought an vintage lampshade frame & wanted it to be updated with a dramatic fuchsia pink Harlequin fabric which matched her new curtains. The shade would be hung above a dining table so would be seen from the underside but was not to be balloon lined as it would hide the pattern on the fabric. A pattern was made from the frame rather than the old fabric covering. Fabric cut on the bias to allow the fabric to be stretched tight onto the frame. The freshly painted frame was bound with India tape at the top & bottom to allow the new shade cover to be be sewn into place. As the underside of the lampshade would be seen from below, the India tape was covered with braid to match the braid used on the face of the shade. I am sure it looks stunning in its new home. 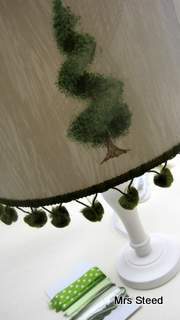 I used this quirky topiary fabric for a lampshade with lovely green pom-pom trimming. 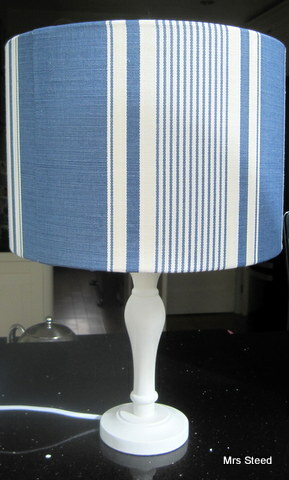 This lovely blue striped fabric from Vanessa Arbuthnott was used to make a lampshade for a boys bedroom. It will be used as a ceiling light with a diffuser to stop the glare from the light bulb (image to follow). 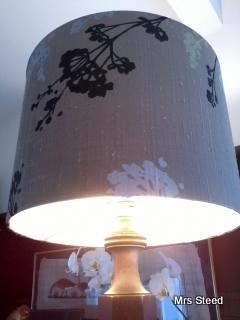 This simple drum lampshade was given a gold lining which casts a lovely soft glow when lit. 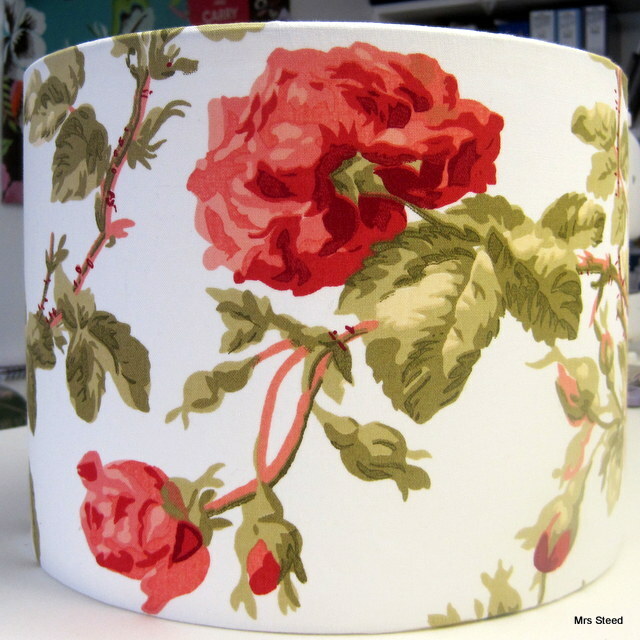 A vintage Laura Ashley fabric was used for this 30cm cylindrical lampshade. 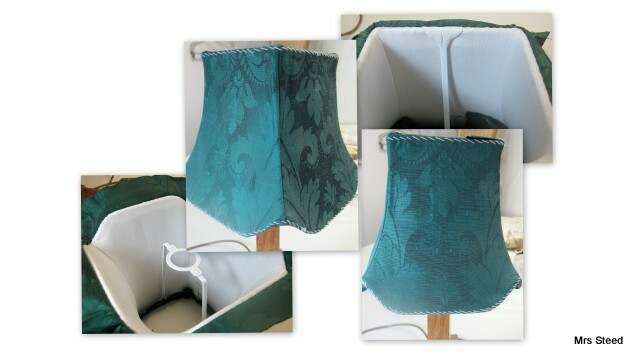 A lovely green silk damask was used to make a small table lamp shade with traditional silk lining….you can see the construction of the shade which is of course time consuming. The stitches on the shade will later be covered with a trim which could be made out of the same silk or a contrasting colour or braid…..what would you choose?